Sometimes, no matter how we take care of our skin, we still end up getting acnes, which can be embarrassing. Acne can also be a big problem for people who have sensitive skins since their skin tends to easily breakout. This is the reason why more and more people are looking for the best acne creams that they can use especially if they have sensitive skin. While there are a lot of acne creams in the market today. It doesn’t necessarily mean that you can just grab the first cream that you see on the shelves. There are some things that you need to consider when it comes to choosing the best acne creams in the market today. Since your skin is already sensitive, this also means that you need to make sure that you are going to purchase an alcohol-free, nonabrasive, and gently acne cream. This will avoid irritating your skin even more. Some acne creams are medicated, which means that they usually contain ingredients that are acne-fighting. Some of these components include benzoyl peroxide, sodium sulfacetamide, and salicylic acid. These components will help you have a clearer skin in no time. Salicylic acid is the one responsible for clearing pores that are blocked while reducing redness and swelling. Sodium sulfacetamide is the one responsible in interfering with the bacteria’s growth. Lastly, benzoyl peroxide will help the skin to be exfoliated while killing the bacteria. You need to ensure that your acne cream contains ceramides, mineral oil, lanolin, and petrolatum. These things can help the skin to be moisturized while exfoliating the areas in our face that have areas that are rough. Another great thing to look for in an acne cream is that it should be hypoallergenic and paraben-free. This just means that the cream should be made out of products that are natural as to avoid causing sensitivity. If you reduce the inflammation, then the chances of the bacteria from growing and developing will be low. When it comes to protections, you should make sure that your acne cream can protect your face. This means that you need to choose something that can shield your face from the harmful UV rays. An acne cream with a sunscreen means that you no longer have to put another product on your face since everything that you need is already in the cream. Another thing that you need to consider is by asking your dermatologist. Your derma will assist you in finding the right kind of acne cream since there are tons in the market today. Since you have sensitive skin, your derma will choose something that is appropriate to the skin type that you have. Himalaya Ace-N-Pimple Cream has the slitty to treat your breakout while letting your skin heal effectively. With regular use, your skin will surely go back to its smooth and soft texture. All of the key ingredients are from lentil; five leaves the chaste tree, Barbados aloe, alum, and as well as silk cotton tree. All of these ingredients are rich with healing properties, moisturizer antifungal, antibacterial, anti-inflammatory, styptic, antiseptic, and astringent. Vie Naturelle Acne Treatment Cream combines the power and medication of benzoyl peroxide. It also has nothing but the best essential oil to ensure of this cream’s healing effects. One of the good things about this acne cream is that it can help get rid of the acne easily and quickly without worrying about your skin. It will, in fact, leave your skin feeling smooth and soft, which will help in the rejuvenation of your skin. Another good thing about the Vie Naturelle Acne Treatment Cream is that since the main active ingredient is benzoyl peroxide, it means that it can also help fight whiteheads, blackheads, and big red pimples. The bacteria will slowly be killed while it is still growing, to ensure that it can be removed quickly and efficiently. Salica Acne Treatment Cream is perfectly formulated to help reduce the size of your pored, wile easily and quickly getting rid of your acne. If you are looking for an acne cream that will restore the beauty, smoothness and as well as the softness of your skin, then Silica is the one that you are looking for. One of the good things about this acne cream is that it is considered as a natural remedy when it comes to getting rid of all the acne scars. The reason behind this is because it helps in stimulating the growth of a new cell to ensure that the appearance of wrinkles and fine lines on your back, shoulder, neck, and face will be reduced. Another good thing about Silica Acne Treatment Cream is that helps remove blackheads since this cream has a mild exfoliation. The exfoliant will help remove dead skin cells and as well as excess oil to ensure that clogging is prevented. Lastly, it helps in reducing cystic acne while lowering its inflammation as well. Breakouts will also be prevented with Salica Acne Treatment Cream. 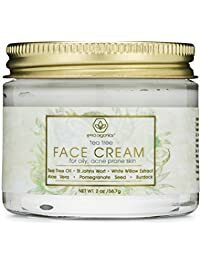 Era Organics Tea tree Oil Cream has a combination of nothing but the best robust formula, which includes dandelion root, goldenseal, burdock root, pomegranate seed oil, coconut oil, zinc oxide, salicylic acid, St. John’s wort, and tea tree oil. All of these ingredients can help in nourishing and moisturizing the base of the skin. It also helps fight impurities and bacteria that is causing acne. Another good thing about Era Organics Tea tree Oil Cream is that it opens pores that are clogged. It minimizes them as well and cleanses them while exfoliating all the dead skin cells. This cream can also help with irritation and soothe redness while assisting with the blood flow. Lastly, Era Organics Tea tree Oil Cream makes the skin smoother and softer to ensure that it is well balanced and supple. These are the top 4 best acne creams in the market today. Of the four reviews listed above, Era Organics Tea tree Oil Cream stood out. The reason behind this is because of the amazing formulation that it has. It does not only keep your skin acne free but as well as blackheads and whiteheads free. This acne cream will surely keep your skin smooth and soft with continuous use. 2 Honey face masks for acne treatment-How effective is it?